After the Christmas tree fiasco, we were certain nothing else would go wrong. 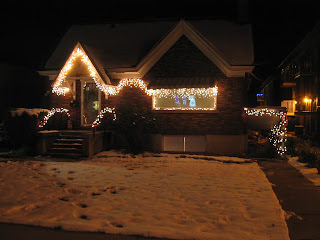 We began decorating the outside of our house with lights. 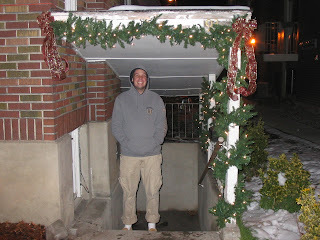 We had already put the garland and bows up and around our columns and railings, but it was now time to brighten it up. We knew we would have to put up two strands of lights cause we only had 150 and 200 light strands. So we began with the 200 whirling and twirling it through the garland just having a wonderful time. This strand soon ran out and we went on to the next section. It was perfect we would have just enough lights to make the house beautiful. This is when disaster struck again. Maybe we aren't supposed to decorate for Christmas. The lights wouldn't plug into the other strand we had just used. Even though we bought them together at the same store, same time, same brand...it wouldn't fit. With the strands we were using...one had the prongs the same size, and the other had prongs that were two different sizes. You know what I am talking about...when there is one prong on the plug that is bigger than the other, so they only fit one certain way in the outlet. So there was no way we could work this out! Can I just say my husband is brilliant/crazy. He decides all we have to do it make the bigger plug smaller. So he takes a hammer and some pliers and shows the thing who is boss. IT ACTUALLY WORKED!! After about 5 or 10 minutes of getting the prong straightened out and small enough Adam plugged it into the first strand of lights. The lights actually cut on (yes Cassie, I didn't say turned on I am proud to say CUT ON)!!! HE IS MY HERO!!! The only thing I was worried about was him getting electrocuted, but he is perfectly fine. Well we went on decorating and our whole house is so pretty. Jonny and Cassie live above us and well...they did a great job also. Here are some pictures because it is finally done! I just hope nothing else goes wrong! You can be proud to speak/write incorrectly if you would like! J/K I know you cant escape it but that just means I will always be able to give you a hard time about it. Fun decorations! You guys sure have bad luck with Christmas decor though!! The sad thing is Jeff & I have a house this year with plenty of places for decoration, but we've been too busy to decorate the outside! We have a tree up at least! By the way, when did you move to a house basement!? Are you still managing that apartment complex? ?